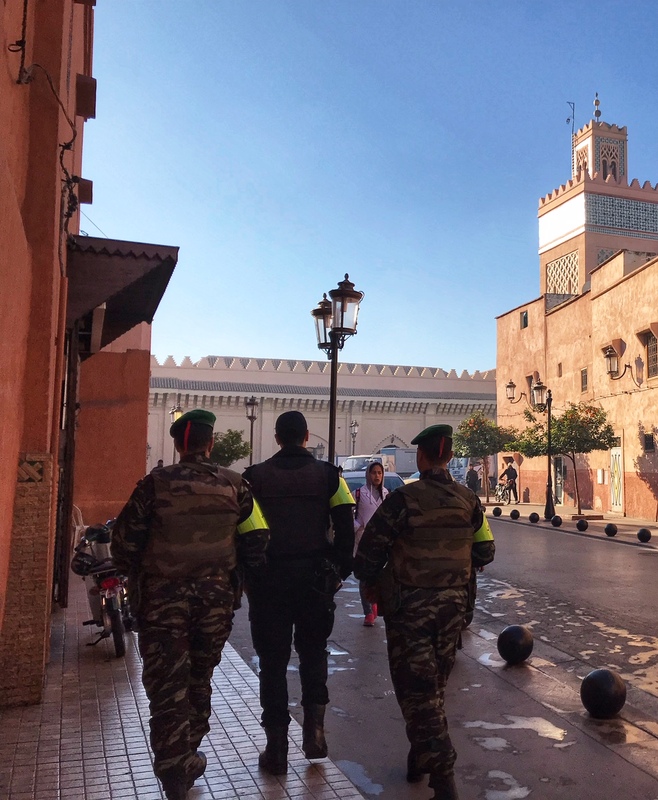 The word “medina” in Morocco refers to ancient original settlements behind protective walls. One source I found said that the medina was entire city of Rabat until the French arrived ca. 1900 and built all around the it for the next 50 years. I stayed for a few days in an old house there. Rabat’s medina is a warren of narrow, old streets lined with old houses called “riads” and small shops. The main streets are filled with people selling things and with pedestrians, motorbikes and 3-wheeled mini-trucks. My guess is that the poorest residents of Rabat live in the medina and earn their living there, as have their ancestors for generations. It is an unpleasant place, unsanitary, unsafe to walk through, chaotic. In the medina in Rabat, Morocco. The medina in Marrakech is the major tourist attraction. It is also a walled and ancient city. Its center is the largest square in Africa, called Jemaa el-Fna. 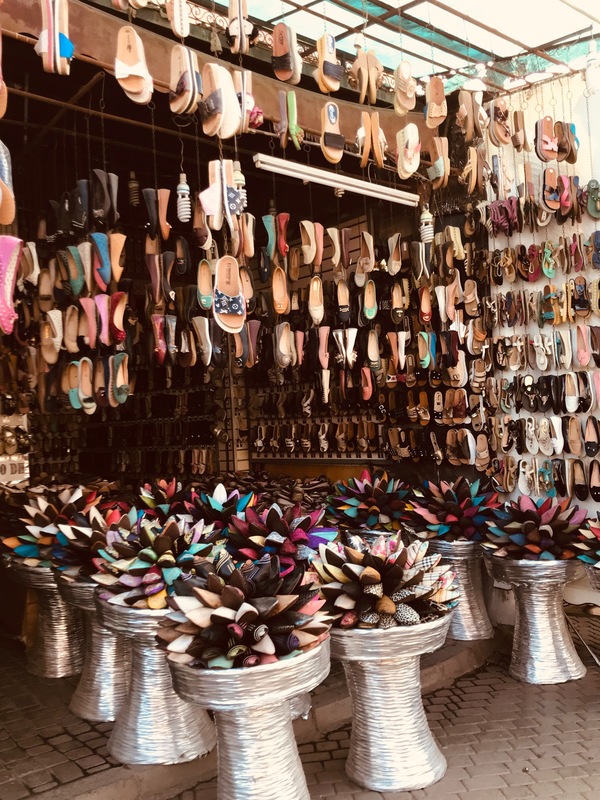 It’s bordered by “souks” – tiny shops selling mostly things tourists buy. The enormous center fills with street food vendors, snake charmers, people in funny clothes who want to be paid for having their picture taken. I was told that I was lucky to come on Monday because the “men from the mountains bring things their families make to sell on Monday.” Indeed, I saw a man selling a pile of rough wool sweaters which were being bought up quickly by Moroccans, not tourists. 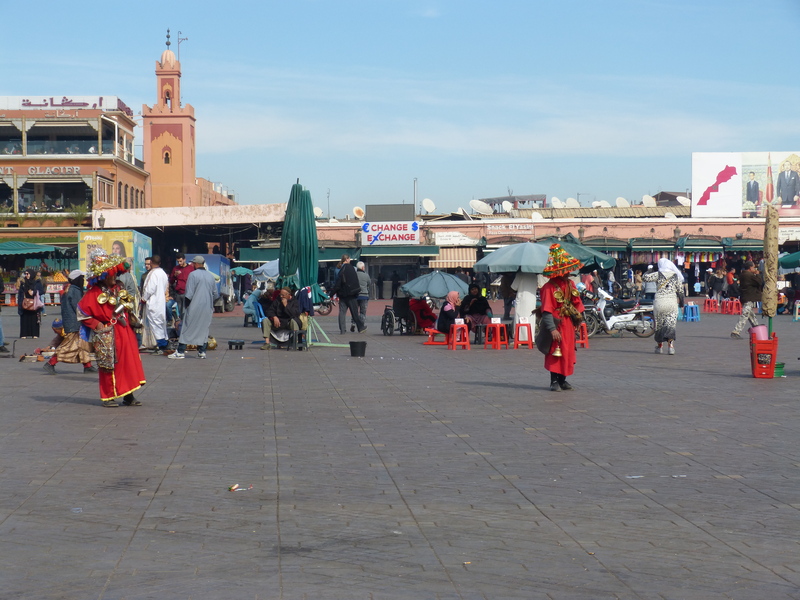 In Jemaa el Fna in Marrakech, men dressesd in red are hoping for tourists to pay them for their photo. In the background notice the minaret of one of several mosques in this area. 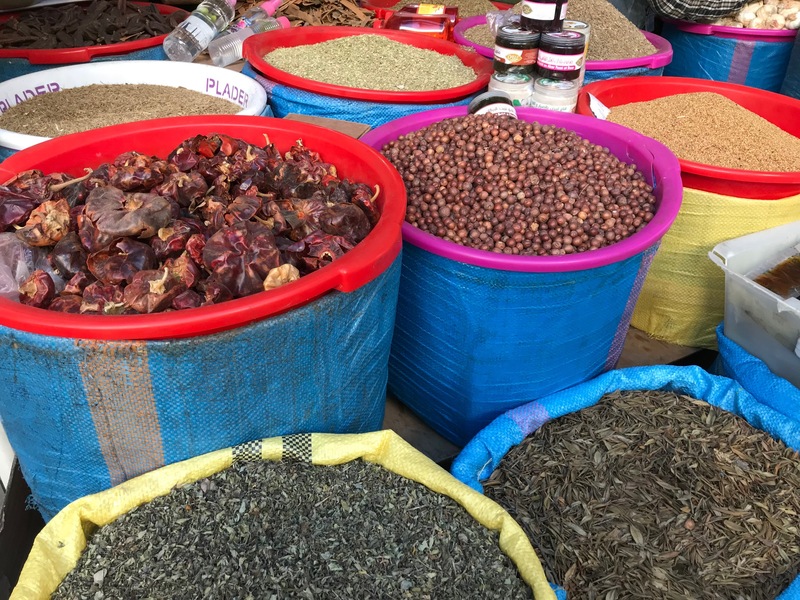 One large section of Jemaa el Fna is for selling spices and other bits of aromatic plants. Smells great! 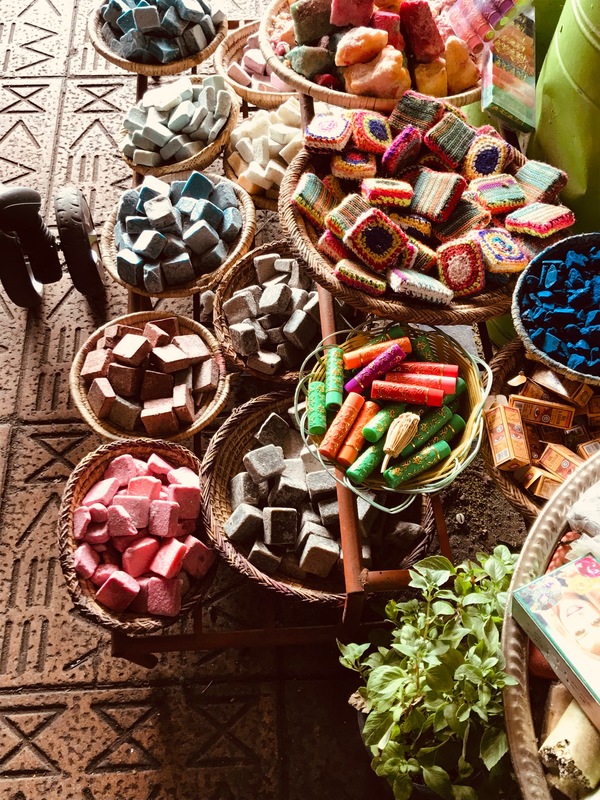 An example of merchadise to be found here: beautiful hand made soaps that smell wondeful (above) and shoes including Moroccan pointed-toe traditional slippers. I found one beautiful quiet corner of the Medina as I left. You may also know the word “kasbah.” This, I learned, is a word for an ancient fortress. 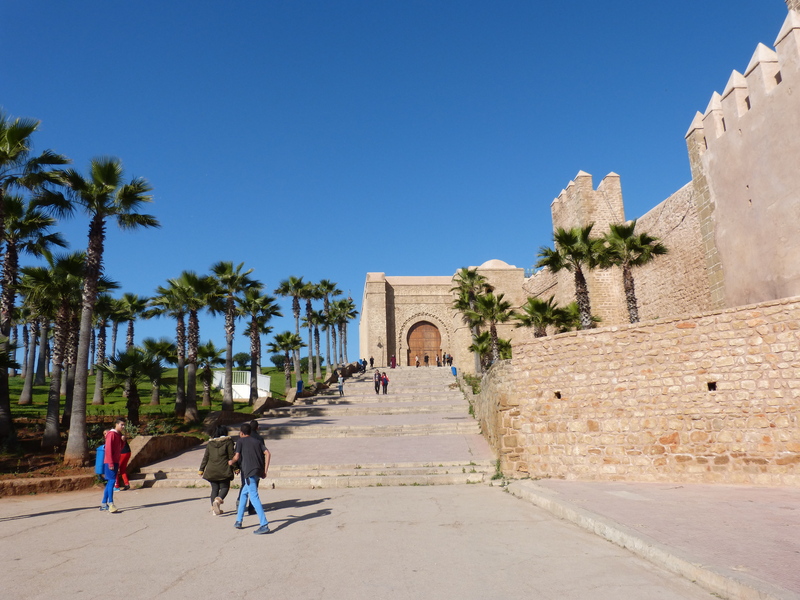 In Rabat the Kasbah is a well-maintained structure at the edge of the ocean, overlooking large beaches and a lighthouse. Along the way in and out there are few small cafés selling mint tea and CocaCola. 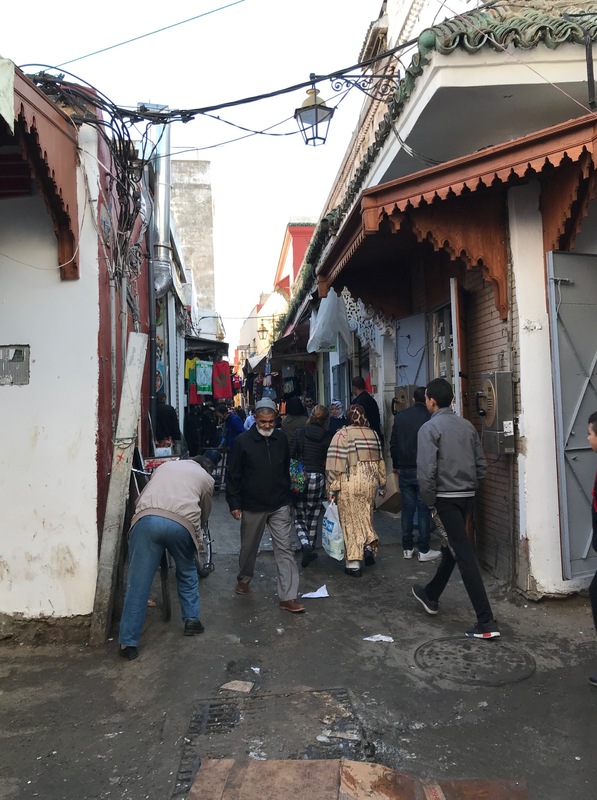 The way out leads to the souks in Rabat – narrow streets of small neat shops selling leather goods and other high-end objects. Tourists come here by the busload. 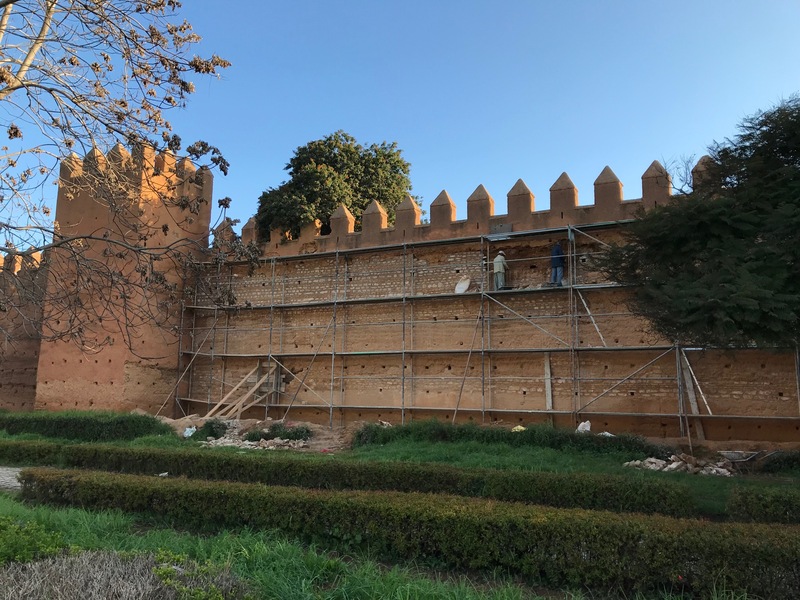 The walls of the Kasbah in Rabat. 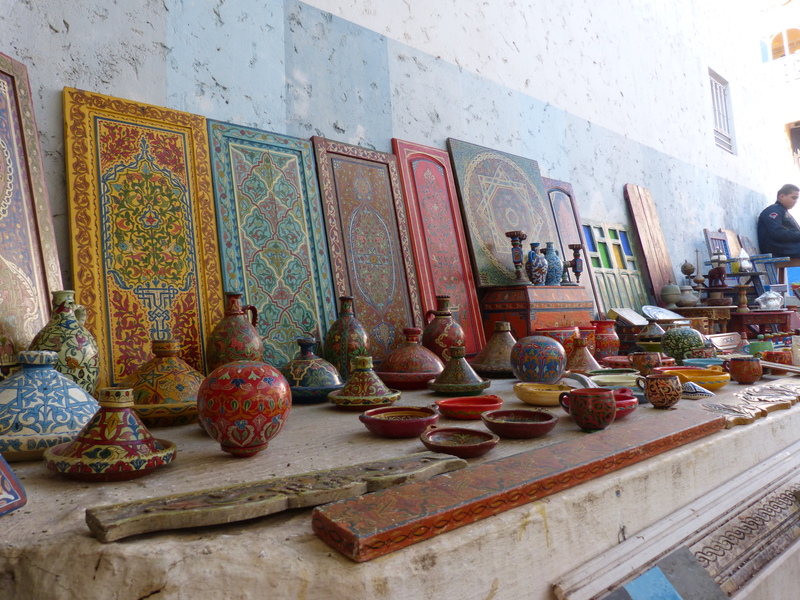 Beautiful wares for sale in the Kasbah in Rabat. 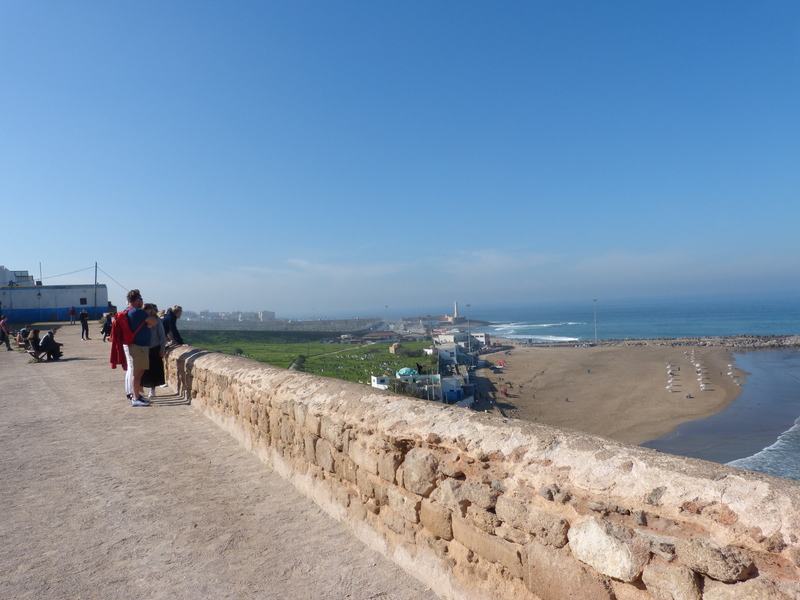 The view from the fortress walls in Rabat’s Kasbah. The Kasbah in Marrakech is south of the Medina and separated from it. There’s a very large mosque at one end with a beautiful minaret (tower). It was much like Rabat’s medina: crowded, chaotic, filled with shops and shoppers. I think it served its residents much more than tourists. Marrakech’s Kasbah is entirely different from the one in Rabat. Here you see some of the omnipresent security forces. Note the large mosque in the background and its minaret on the right. 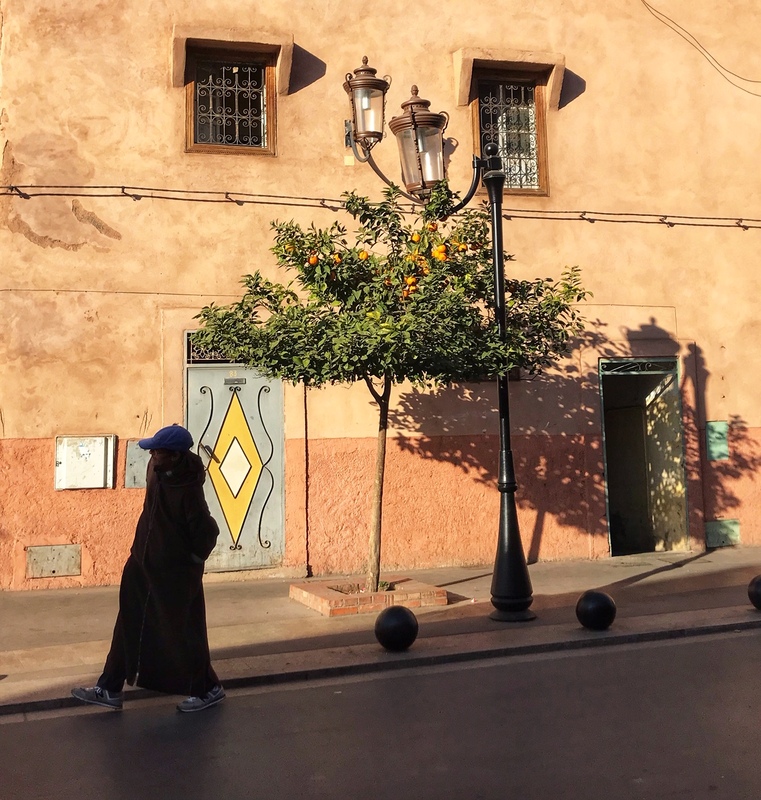 Perhaps my favorite picture: early morning, oranges on the tree, Moroccan pink wall and one woman alone. 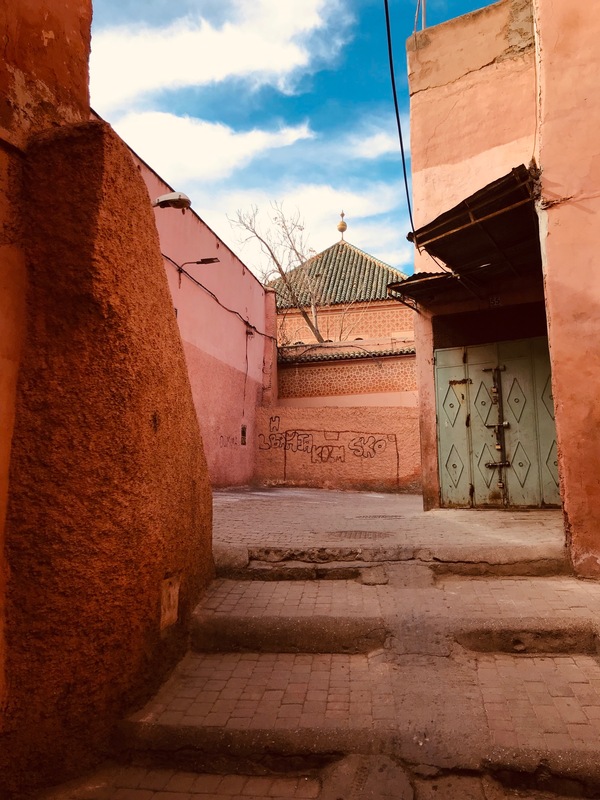 I hope these photos will give you a sense of these places in Morocco.